Sweet potato rice is nothing more than diced or minced sweet potatoes. Yes, it does cost more than slicing the vegetables on my own. But it is much less expensive than a trip to the ER if I were to attempt cutting these on my own. I’ve made this quick and easy recipe with all the nutrition and flavor you could ever want. And it’s prepped and cooked in less than 30 minutes. *If you aren’t a fan of squash or zucchini, switch those out for other vegetables that you enjoy; bell peppers, kale, broccoli, canned carrots or corn are just a few examples. 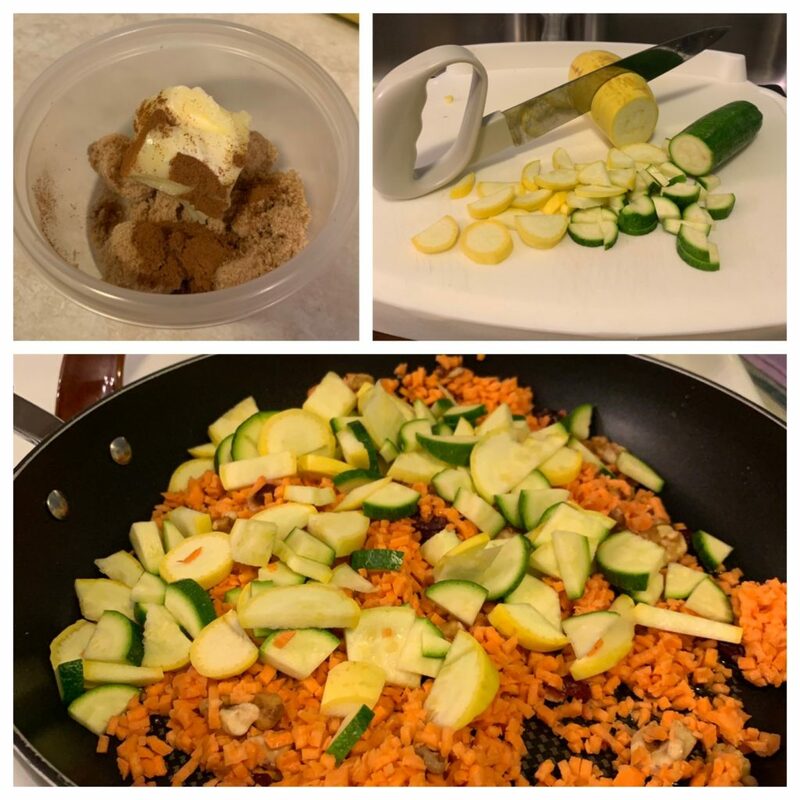 Cut the zucchini and squash into slices. I like to cut the slices into quarters for bite-sized pieces that cook quickly. Place the brown sugar, butter and cinnamon in a microwave-safe container and nuke for 20 seconds. Stir well. 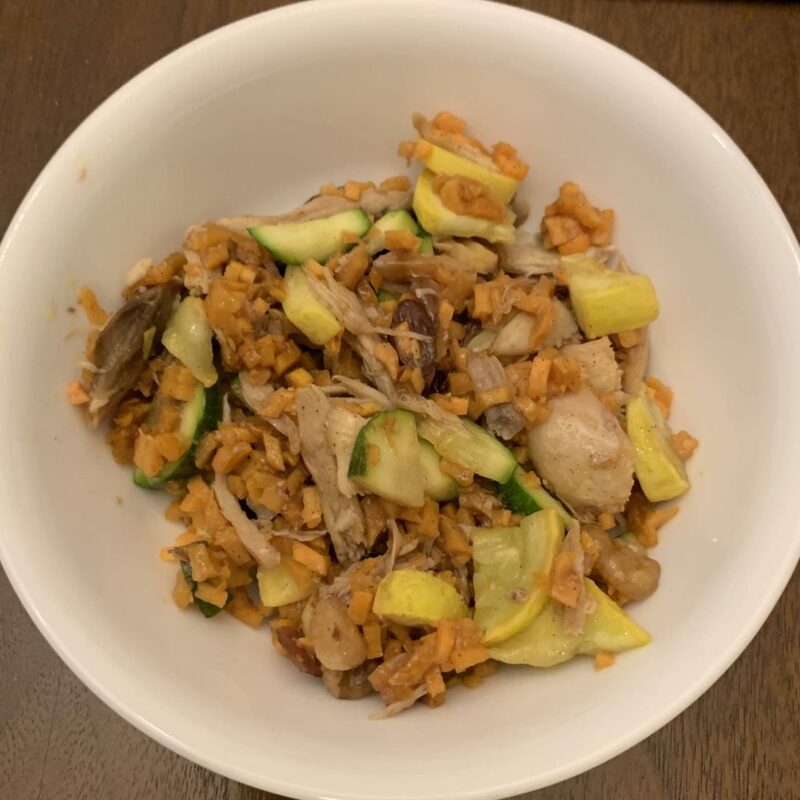 Pour the olive oil into a pan and add the sweet potato rice, zucchini and squash. Cook over medium heat. After 5 to 7 minutes, mix in the chicken, cinnamon butter mixture and salt. Stir well. Continue cooking until the vegetables are cooked to your liking. I prefer my veggies with a little crunch and cook everything for about 15 minutes over medium heat, stirring every several minutes. One pan. Nine ingredients. Healthy. Easy clean up. And best of all – oh, so yummy. Rotisserie Chicken. My mom graciously takes the meat off the bones of several rotisserie chickens at a time. She places about a cup and a half of chicken into a freezer bag. When I am ready to cook a meal, I defrost the chicken and toss it in. Reflex Carving Utensils. Chef’s Knife, Smooth edge on 8″ (20cm) blade – Model AA5245. Unfortunately, I can no longer find this knife for purchase online. If you have an adaptive knife that works well, please contact me and let me know. Clean as you cook. Energy is a precious commodity and I find that if I throw away garbage and put dirty dishes in the dishwasher as I cook, there’s very little clean up to do after eating the meal. Next postPodcast with Kyle Idleman: Why Did This Happen to Me?